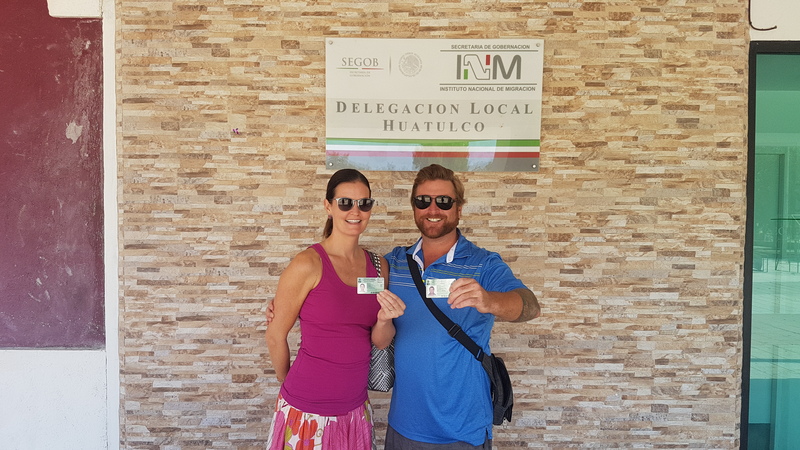 Recently, Erin and I applied for our Permanent Resident Visas here in Mexico. This process has 2 stages and can take a bit of time. So, I thought I would share our experience with you, if you don’t want the inconvenience of having to leave the country every 180 days to renew your Tourist Visa. You have two options for residency in Mexico, a Temporary Resident Visa (4 years) or a Permanent Resident Visa. The criteria for temporary vs. permanent vary slightly, but if you’re planning to buy or already own a home here in Mexico, I suggest you go straight to permanent residency. Since we just completed this process, I’d like to share with you some important points and some “lessons learned” from our experience. The first thing you’ll need to know is where to start the process, and it’s not where you might think. You actually have to begin the process outside of Mexico! Yep, that’s right. I know a lot of expats that come here ready to begin their journey to becoming a resident only to find out they now have to leave to do it! The first stage of the resident visa process begins with you submitting an application and an interview at a Mexican Consulate beyond Mexico’s boarders. A lot of articles and experts will tell you that you have to begin the process in your home country. That’s not true! And, in fact, that didn’t work for Erin and me. We made our initial petition back home at a consulate in Canada, and we were denied! For whatever reason, the officials at that particular consulate said, “No”. Which was more of an inconvenience than anything because there’s no “three strikes you’re out rule”. It just meant we needed to find another consulate where we could schedule another interview. So, on our following trip home, we visited a different Mexican Consulate in a different Canadian city. And, again, “Nope!”. Sigh! At this point, we started asking around. Polling our other expat friends who had been through the process to see where they had gone for their initial interview. We kept hearing the same city mentioned, again and again, Phoenix, Arizona. It seemed that, again, for whatever reason, the journey to residency was just easier if one took the path that leads through Phoenix. 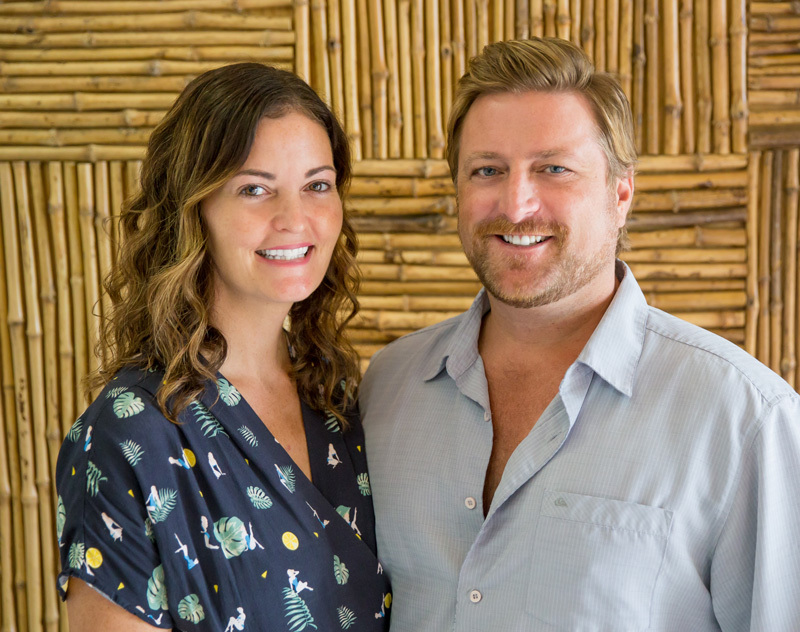 Lucky for us, we had an International Living conference coming up in Phoenix! So, we made plans to arrive early and scheduled yet another interview. And it didn’t matter at all that we hold Canadian Passports. And, you’re going to want your passport with you at the interview because that’s where they will attach your permission to continue with the next phase of the process once you’ve returned to Mexico. But before you do anything, you’re going to want to make sure you qualify for residency first. 1. You are related to a permanent resident of Mexico or a Mexican by birth up to the 2nd level (i.e., grandparent, parent, sibling, daughter, son or grandchildren). In the case of siblings, it only applies if the applicant is under the age of 18 years old, is not married and is under the sibling’s legal representation. 2. You won’t be earning money in Mexico or are retired and can prove sufficient monthly income from your pension or other means to cover living expenses during your stay in Mexico or have sufficient savings/investments that allow you to maintain yourself living in Mexico. 3. You have held a Temporary Resident card for four consecutive years. There are three other ways to qualify for permanent residency in Mexico, but I’m assuming, if you’re reading this, you’re not a political refugee seeking asylum. So, I’ll skip that one and a few others that likely don’t apply! Once you know you qualify, you’ll want to gather the necessary documents to prove that to the officials who will be interviewing you. So, if you are qualifying based on income or assets, this means financial records. If it’s based on relations, birth certificates and family documents. There are also several forms to be filled out (in Spanish) that make up your application. 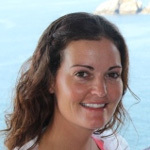 Erin and I elected to work with a local lawyer here in Huatulco to help us prepare our documents and walk us through what to expect during the process. I highly recommend this. It will not only save you a lot of time but also a lot of potential headaches, especially if you don’t speak Spanish. How Much Money Do You Need To Qualify? 2. Original and a photocopy of proof of investment or bank accounts with an average monthly balance equivalent to $110,615.00 Canadian Dollars during the last twelve months. These dollar amounts change a bit every year, so you’ll want to check for the most current information before you schedule your interview. In Phoenix, we found the interview process very easy and pleasant. We were asked several standard questions and then asked to provide our application and documentation. It was clear we met the qualifications, and there were no issues with our paperwork. 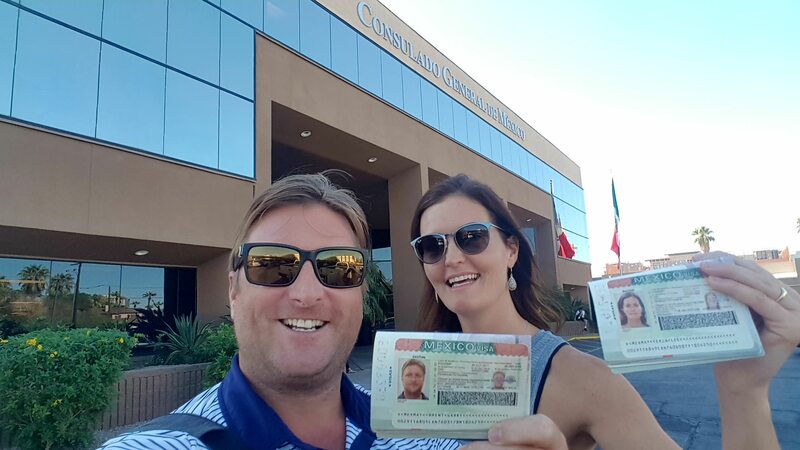 However, we still had to wait a few days (this can take up to 10 days) before we could return to the consulate and get our passports back with the special Mexican Visa sticker in them to let immigration officials know we’d soon be getting permanent residency. You’ll want to make sure you show that to the immigration officials upon your return to Mexico. From the date you get that special sticker in your passport, you have 180 days to return to Mexico. And once you enter the country, you have 30 days to start the next stage of the process, which will take place at a local immigration office. In some cities, you may need to make an appointment in advance to begin the next. Here in Huatulco, we’re lucky, we can just walk in, and there’s never a long wait if any! Since we had decided to work with a local immigration lawyer to help us, the rest of it was easy, but I wouldn’t say simple. It’s not like you’re just going to walk into your local immigration office, flash your shiny new visa sticker in your passport and it’s a done deal! Nope! You’ll make several more trips to the local immigration office, fill out more required forms, provide personal documents, supply passport photos and, of course, pay for your Permanent Visa (currently $4,828 Pesos). Which, by the way, you’re not going to do at the Immigration office, you’ll have to go to a bank to do that! You can also expect to provide your fingerprints to be kept on file before your Permanent Visa card is approved and printed. Then, you’ll wait a week or so and return to pick up your card, which looks a lot like a driver’s license. Are you starting to see why it was a “no-brainer” to pay a local lawyer to walk us through the process and file our paperwork with us? Again… Highly recommended! So, you’re probably wondering just how long this process could take. Well, it depends on how long you wait in between being granted your initial visa, the one in your passport, and when you re-enter Mexico, of course. But I can tell you once you’re in country and begin the process here it may take up to a month to complete the process and actually have your residency card in hand. And this is important to remember because you can’t leave the country while the process is on-going, or if you must leave, you’ll need to get special permission and documentation to do so. Once you have your Permanent Residency card, you will have to renew it every ten years to keep your photo current. It may seem like an intimidating process, but it’s well worth it. Once you have residency in Mexico, you are entitled to certain perks that go beyond not having to leave the country every six months. Such things as, access to the social health care system, and if you’re over 60, you can apply for a special seniors’ card that gives you deep discounts on travel, food, and in some cities even property tax and water bills! Hello Mike, Here is information for couples applying for residency (taken from the internet): In the case that only one of you has the basic qualifying income, or account balance. You must, to include a spouse, add 100 to the number of days required for the valid Resident visa – per person. You will also need documentation proving the relationship (i.e., an apostilled marriage license). Hello. You do not have to be retired to qualify for residency in Mexico. All you have to do is show the monthly required income, or the required larger amount in a bank account in your name. We were able to do that, so it was no problem. The amount of money is what is important, not the source. Hello Brent. If your in your 40’s or 50’s are you held to higher money standards than what you mentioned above, and/or are you more likely denied the visa? No, that’s not how it works. You either qualify or you don’t. There are no benchmarks for age in the process. Hi Brent, we just finished the permanent process and got our cards the day before Thanksgiving. Now we are leaving Mexico headed for Oregon to sell our home there. We own a home in Mexico already. Is there a time limit on how long we can be outside of Mexico? We sure do not want to lose them and have to start over. Hello Charlie, As far as I know, as long as you have already completed the process and have your cards, there is no limit on the amount of time you can be out of Mexico. Just be sure to follow the correct procedures prior to leaving Mexico, now that you are residents. Great insight, would you mind to elaborate on the interview process with the mexico consaltation? What sorts of aspects do they normally focus on? The questions asked will be related to whether or not you meet the requirements for becoming a resident. And this will vary depending on where you go to initiate the process. Thanks for the reply Erin, my situation is a bit tricky. I’m in my 20’s and would like to apply for the PR or TR status with my mother. She liked environment and temperature along with its close distance to the U.S. And I would like to apply it for the ease of visiting. We are all planning on using the sufficient fund method for the application. However, either of us has much of a history with Mexico. Based on your knowledge, do you think we will have a hard time getting approved through the interview process? >You won’t be earning money in Mexico or are retired and can prove sufficient monthly income from your pension or other means to cover living expenses during your stay in Mexico or have sufficient savings/investments that allow you to maintain yourself living in Mexico. If you have sufficient funds, you CAN work in Mexico (i.e you are not really retired from working)?? I am a physician and would be interested in looking into working in a private hospital. Certainly there are many foreigners who work in Mexico. Normally this requires you to do some paperwork with immigration to approve your rights to earn in Mexico. In your case, as a physician, you may also have to become board certified in Mexico to be able to see patients here. You will want to look into this and be clear on all that must be done in order to work as a medical professional here in Mexico. Thank you for your reply Erin! I read my question and it didn’t really express what I wanted to ask. I was trying to ask if you can apply for perm res with the claim that you are ‘retired and have a pension’ but then once you get it, do you have the right to work? IOW you are no longer ‘retired’. I mean, will they forbid you from working bc you got the perm res on the basis of being retired. Do you have apply for permanant residency in Mexico prior to purchasing a property there or can you purchase first and apply for permanant residency later? Is it easier to qualify for permanant residency if one applies after aquiring a condo in Mexico? What do you recommend? You can do either or. We have had clients that have purchased and then gotten their residency but yes as you mention it is easier if you have already purchased a condo. Thanks for the previous reply Erin! My situation is a bit tricky. I’m in my 20’s and would like to apply for the PR or TR status with my mother. She liked environment and temperature along with its close distance to the U.S. And I would like to apply it for the ease of visiting. We are all planning on using the sufficient fund method for the application. However, either of us has much of a history with Mexico. Based on your knowledge, do you think we will have a hard time getting approved through the interview process?